On an emotional night in Winnipeg as fans came together to sing the Canadian National Anthem to pay their respects to the soldiers that recently passed away in Ottawa, former Southeast Division Rivals Tampa Bay Lightning and Winnipeg Jets clashed in a very intense hockey game. This game almost had the feel of a division rivalry, even though Winnipeg now plays in the Western Conference. There was a ton of extra-curricular activity after the whistles and the teams combined for 28 penalty minutes. There was alot of hits and physical play throughout the night. 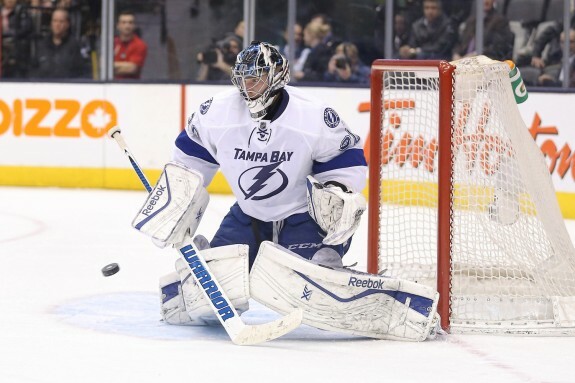 However, the story of the game was Ben Bishop and the Lightning offense. Bishop was spectacular making 40 saves in the game. It was not an easy 40 saves by any means as Winnipeg had 5 power plays throughout the game and constantly sent pucks Bishop’s way from prime real estate areas in front of the net. Bishop’s almost unbeatable down low and made a ton of difficult right pad saves look relatively easy. Bishop had Mathieu Perrault, who Winnipeg recently signed in the offseason from the Washington Capitals, searching for answers tonight. In the 2nd period Bishop stoned Perrault on a partial breakaway with a glove save following a turnover by Radko Gudas. Minutes later Bishop shut the door with his right blocker on a Perrault deflection from the slot. Coach Jon Cooper was certainly impressed with Bishop’s play tonight. “He was the factor in the first two periods for sure; you need that last line of defense,” said Cooper. For the second consecutive game Jonathan Drouin was one of the best player’s on the ice for the Lightning. It was Drouin’s effort that got the scoring started on this night for the Lightning. At only 4:41 into the game Drouin made a nice play on the boards, taking the puck away from the Winnipeg defenseman Clitsome, and passed the puck up to Stamkos. Drouin immediately and instinctively used his speed to get into the play, and skated directly towards the net with Stamkos on a 2-on-1. Stamkos sent a pass under Zach Bogosians stick to Drouin who collected the pass and then delivered a backhand cross-crease pass to Stamkos for the tap in and 1-0 lead. Early in the 2nd period Drouin scored his 1st National Hockey League goal off of a cycle down low to Nikita Kucherov. Tyler Johnson sent a pass cross-ice to Drouin, but it was too far in front of the rookie. Drouin collected the puck along the halfboards, took a hit from Lowry, and cycled the puck down low to Kucherov. Kucherov held the puck behind the net and Drouin went directly to the open space all alone at the bottom of the left circle and snapped the pass short side over the blocker of Ondrej Pavelec. Drouin definitely will not forget that one. “Unbelievable, obviously in Canada it’s even more special, it’s an exciting time for me, and it only happens once, so I’m going to remember this one for a long time,” said Drouin. Winnipeg would cut the deficit in half less than a minute after Drouin’s goal when Brian Little beats Bishop on the power play past the glove on the far side with a shot from the bottom of the left circle on a pass from Enstrom. It was Winnipeg’s first power play goal of the season. Their power play is connecting at an abysmal 4.17% success rate so far on this young season. The Lightning would go on to score two more goals in the second period en route to a 4-2 victory on Friday night in Manitoba. Again it was the young kids on the team that stepped up. A one timer by Ondrej Palat, who was initially credited with the goal, was tipped in front by Lightning’s young rookie center Vladislav Namestnikov, scoring his 2nd NHL goal. That goal would be the eventual game winner and it would come with man advantage. Namestinikov, 21, has fit in nicely for the Bolts so far this season and seems to be developing good chemistry on that 3rd line with fellow 21-year-old Russian Nikita Kucherov. Interestingly enough Namestnikov and Kucherov were 1st and 2nd round picks respectively in the 2011 Draft by the Lightning. Namestnikov already had an established North American style game having played 2 seasons in the Ontario Hockey League for the London Knights. He was selected 27th overall by the Lightning in the 2011 draft. Kucherov was selected in the 2nd round at 58th overall. Kucherov , who originally played professionally for 9 games in the KHL , also decided to go the Canadian Junior route as well to adapt to the North American style of play. Kucherov played one season in the QMJHL and scored 33 goals and 29 assists for 63 points playing for the Quebec Remparts for 6 games before being traded to the Rouyn-Noranda Huskies. Keep an eye out for Namestnikov and Kucherov if they continue to develop more chemistry as the season goes along. Ondrej Palat scored the Lightning fourth and final goal of the evening on yet another odd man rush. Tyler Johnson came across the Winnipeg blue line with a ton of speed following a faceoff win at center ice and a nice touch pass from Kucherov. Johnson sent a perfect pass on the tape of Palat who snapped it home before Pavelec could get over. The Winnipeg defense was out of position a lot more than head coach Paul Maurice would have liked to see that’s for sure. The Bolts went on to win 4-2. Goalie Ben Bishop has the most games played since the start of last season allowing 2 or fewer goals in a game. The injury plague continued again for the Lightning as JT Brown and Brett Connolly left the game with upper and lower body injuries. The young guys are going to have to continue to step up for this team if they are going to continue to win hockey games. The Lightning are now 3-1-0 on their Western Canada Road Trip and now conclude the 5-game-trip tonight with their toughest test against the Minnesota Wild.